“Good morning Steve, and Happy New Year!…I would like that when the user has a wired NIC up and running, the wireless NIC is automatically disabled, and as soon as the wired NIC disconnects, the wireless NIC activates. There are other reasons for wanting this too. If you have both connections running, things like file transfers, or anything that needs the extra speed of Ethernet…might end up going through the wireless instead. 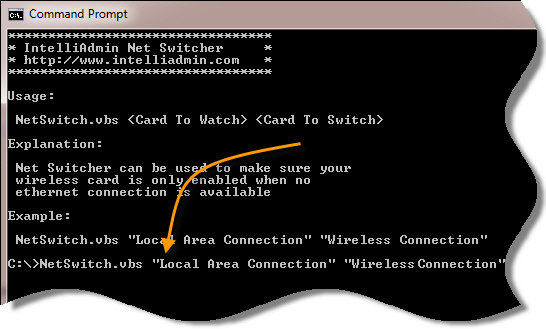 For this question, I have created a VB Script that will receive the names of the two network cards in its command line parameters. See the descriptions for them? That is what you will use to identify them. The program will not display anything, but run in the background looking for the change. It will continue to run until the user logs out. 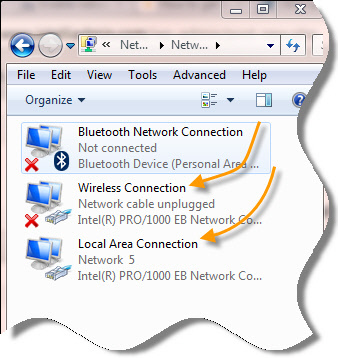 If the Local Area Connection is no longer connected, it will automatically enable the Wireless connection. The reverse is true…if Local Area Connection becomes available, it will automatically disable the wireless connection. The best place to run the script would be from a group policy computer configuration logon script (Not a user configuration) because it will run as local system and have the proper permission to enable and disable network cards. Just rename to NetSwitch.vbs after downloading. to Remco’s question. How would you modify the script to release the DHCP address prior to switching adapters? This manages to release the address, not sure how to insert into your code. Just saw it on the website. Hi Steve, thanks a lot! I have been looking for this for a very long time. I set the script to run once login by creating a batch file and put it to the startup folder. I also saw the coding from Chris and yourself on the releasing of DHCP which will help alot as one pc using 2 ip address is too much and I always have to clear the DHCP scope manually. I’m not much into coding so I will greatly appreciate if you can incorporate the script to release DHCP into your original script. Thanks again! I need a permanent registry reorder of the NICs. Any VB Scripts available? As far as I know…I have not seen any. The issue would be that I believe this is different in different versions of Windows. Trying to write this to the registry could corrupt your entire network setup if not done just right. Nice script, but it works only one way. When I attach the network cable to the Laptop it DISABLES the Wireless, but when I unplug the network cable it should DISABLE the LAN Adabter and ENABLE the wireless. I know it depends, which card you use to watch, but I want use the both way. Is there any chance to achieve this? I believe this is an issue with the windows subsystem. VB Script tries to disable the card, but returns an error because no cable is connected to the device. is there a way to solve it??? Hi, Steve — thanks for this script, this goes a long way to solving my connections issues. Not being a VBScripter myself, is there a way to alter the script so that multiple connections would be disabled at the same time as the Wireless? IE, I’d like to have it disable the ‘Mobile Broadband Connection’ and possible another as well as the ‘Wireless Network Connection’ when the LAN is plugged in. Any assistance would be greatly appreciated — thanks again! This script is excellent. I’ve implemented this in my organization via GPO, but there’s one catch: It does not work for non-admins. I apologize for my lack of GPO knowledge, but where exactly should this script be configured in a GPO so that it works for non-admins? Currently I have it configured under User Configuration -> Windows Settings -> Scripts (Logon/Logoff) -> Logon. The parameters are set to “Local Area Connection” “Wireless Network Connection”. The only other place I can find under Computer Configuration is: Computer Configuration -> Windows Settings -> Scripts (Startup/Shutdown) -> Startup … but it doesn’t seem to work there. Any help would be great! I’d love to push this out to all of my users. We are running Server 2003 and Windows 7 x64 client laptops. Not much you can do with non admins. The reason is that you need to have local admin rights to enable or disable a network card. Yes, if you make it as server which will run from System account and watch network behavior. I would like your help … Now download the script, change the file extension, can not get the script to work me. I am connected by ethernet and wifi does not turn off, the operating system language and script has something to do, my system is in Spanish. This has really saved me a lot of time – thanks for all of your help. I am however having one issue. While the script works and works well I have added in the feature to release the Wireless SHCP lease once disabled but once I connect back in my LAN cable it’s coming up as “unidentiifed network” and the only way to get it back in action is to ipconfig /renew – where am I going worng? WScript.Echo "* IntelliAdmin Net Switcher *"